Contestants can participate in one of two age groups: 16 and younger for juniors; senior category will be 55 years and up. The senior category will require possession of a valid GA fishing license. Prizes will be awarded in each age group in several categories. Lunch will be provided for participants. $1 plus $5 parking. 912-384-7082. Kids 15 and younger can try to win prizes for largest fish or youngest angler, as well as a door prize. Register between 7:30 - 7:45 a.m. at the main office and enjoy some great fishing in Lake Liberty. Refreshments will be available. This program is in conjunction with National Trails Day. $5 parking. 706-456-2602. This tournament will be held at Lake Liberty. Anglers 55 years and older can try to win prizes in several categories, as well as win a door prize. Register between 7:30 - 7:45 a.m. at the main office and enjoy some great fishing. Refreshments will be available. $5 parking. 706-456-2602. Kids ages 2-12 are invited to join the park and our friend's group for a fantastic event. There will be prizes for many categories. We will be meeting by the gazebo in the park. $5 parking. 912-287-4900. Looking for a fun and exciting way to spend your Saturday night? Then look no further! Sign up for one of our Family Day Camps. 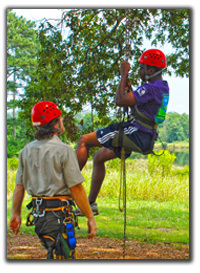 Each session will offer a unique way for family members to spend time together in the great outdoors. $10 per family member. Registration required. $10 plus $5 parking. 770-867-3489. Sign your Junior Ranger up for an after hours camp. This one night session will include fishing, a night hike, and more park fun! The cost is $25 per camper, $5 off each additional camper registered. Ages 6-12 are welcome. Registration required. Call the Park office to register at 770-867-3489. $25 plus $5 parking. 770-867-3489.